There are good parts in “Cake” which almost make it look like a film worthwhile to watch, and then there are also bad parts which could have been discarded or modified without any serious problem. The movie wants to tell a small, intimate drama of personal grief and pain, and it has everything required for engaging us, but then it is ultimately hampered by several glaring missteps in the story. The result is like a cake partially ruined by its misguided decoration, and this is particularly disappointing considering the solid materials inside it. Its story revolves around the difficult and depressing daily life of Claire Bennet (Jennifer Aniston), a woman who has been suffering the physical and mental pains resulted from some automobile accident. While she is addicted to painkillers due to the chronic pain of her damaged body, she still grieves over her personal loss caused by that terrible accident which shattered her life in the past. Her marriage with Jason (Chris Messina) was ruined because of that, and now she lives alone in her house while mostly being isolated from the outside. Always looking bitter and exhausted, she is not very cooperative during her support group meeting which she routinely attends. One of their members recently committed suicide, so the support group counselor, broadly played by Felicity Huffman, suggests that they express how they feel about it while pretending that dead woman is right in front of them, but, unlike others, Claire is not so inclined to do that. When her turn comes, she throws a barbed comment on the circumstance surrounding that sad incident instead, and that gets her promptly expelled from her support group meeting. Along with her alcohol and painkillers, Claire prefers to stay inside her miserable shell rather than trying to get any better. While having wasted her physical therapy sessions with no particular advance, she just wants to lie down on the bed in her bedroom without moving her suffering body, and she merely remains passive and unmoved even during her one-night stand with a handsome handyman she lets into her bedroom during one night. At least, she has been taken care well by her caring Mexican housemaid Silvana (Adriana Barraza), who has tolerated her employee’s unpleasant sides mainly because she understands that her employer is a damaged woman who needs help. This kind, thoughtful woman sometimes drives for Claire while Claire is lying down on the passenger seat, and there is an amusing moment when they go to Mexico together for buying a bunch of painkillers without prescription. Of course, smuggling drugs across the border turns out to be not as easy as Claire thought, but, as a Mexican pharmacist points out, she is a suburban middle-class Caucasian lady, and she can certainly get help easily even when she gets in trouble at the border checkpoint. Meanwhile, Claire begins to experience the hallucination involved with that support group member who killed herself. While feeling some guilt on the death of Nina (Anna Kendrick), Claire also becomes curious about the circumstance surrounding Nina’s death. She goes to the site where Nina committed suicide, and she even comes to Nina’s house and meets Nina’s Australian husband Ray (Sam Worthington), a nice guy who is still at a loss while not knowing what to do with his life as well as his young son. The movie works when it depicts how Claire slowly comes to realize her need to pull herself together through her small, tentative interactions with the people around her. Through the possible beginning of her relationship with Ray, she becomes a little nicer to others, and Silvana also helps Claire getting out of her shell bit by bit. And then “Cake” takes a sudden turn as going into its problematic third act, and it never recovers from that as losing its focus and direction. The screenplay by Patrick Tobin stumbles especially when it attempts very obvious moments of symbolism (hint: they are associated with its title), and it is also riddled with several problems including underdeveloped supporting characters. While the movie wisely does not push Claire and Roy into a romantic situation, it fails to develop their relationship further into something more meaningful, and it also does not go deep into the relationship between Claire and her ex-husband, who still cares and worries a lot about her even after their divorce. In case of Jennifer Aniston, she deserves praises for doing something which would probably be appreciated by my late friend Roger Ebert. He once said this immensely likable actress should take more difficult roles rather than her usual lightweight comic roles, and Aniston did throw herself into a challenging role here in this film. 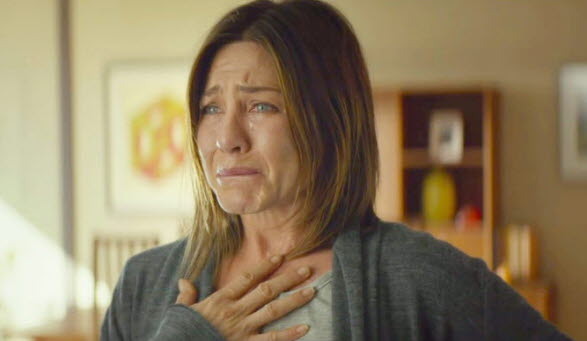 While never asking for pity or sympathy, she stays true to her unlikable character, and Claire’s gradual inner change along the story is believable thanks to Aniston’s good performance. Although most of the other actors in the film are sadly not utilized well, Adriana Barraza, who is mainly known for her Oscar-nominated turn in “Babel” (2006), is wonderful as the counterpoint to Aniston’s character, and the movie becomes more interesting whenever these two actresses are together on the screen. “Cake” is directed by Daniel Barnz, who made a debut with “Pheobe in the Wonderland” (2008). While appreciating its good parts, I disliked that movie for its annoying parts including its young heroine’s exaggerated hallucination, and the same thing can be said about “Cake”, which falters whenever Anna Kendrick’s hallucinatory character appears (this is certainly not the fault of Kendrick, who is always a welcoming presence on the screen). Its story surely deserves to be told, and Aniston gives a rare dramatic performance to notice, but I only wish the movie could have handled them better than this. This entry was posted in Movies and tagged Addiction, Illness, Suicide. Bookmark the permalink.